Mail.ru releases Cloud Mail.Ru app for Windows Phone devices. Cloud Mail.Ru is a free service to save photos, videos, music, presentations, documents and other files. 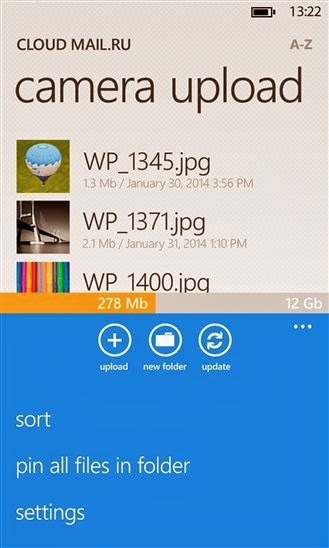 Install Cloud Mail.Ru app on Windows Phone and get free 100 GB on your virtual disk. You can now get the free app on Windows Phone Store for Windows Phone 7.5 and 8 devices. With Cloud Mail.Ru all your files will always be at hand. Upload the files to your cloud drive and they will automatically be available on all your devices. + Upload photos from your mobile phone. Adjust the automatic saving to disk in the cloud Camera Uploads folder when connected to Wi-Fi. + Share files and folders with friends and colleagues in one click. + Save the traffic - you can send a link to a image, video or document by SMS, e-mail, instant messenger or social network. + View MS Office documents: Word, Excel, Power Point, PDF, as well as files in other formats. + Download to your phone and edit documents in the MS Office applications. + Cloud Mail.Ru for Windows Phone allows you to watch videos and listen to music and create playlists of your favorite tracks. + Manage your files from anywhere - rename, delete, create folders. + Keep your important files in a safe storage! Whatever happens to your drive on your PC or phone, all files stored in the Cloud will stay with you. + You do not need any wires, flash drives and memory cards. All you need is a free app Cloud Mail.Ru and internet connection.